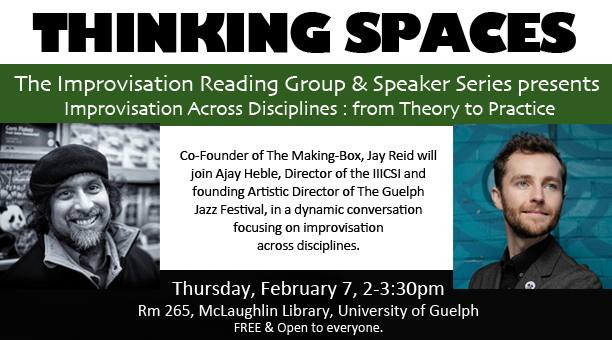 Co-Founder of The Making-Box, Jay Reid will join Ajay Heble, Director of the IICSI and founding Artistic Director of The Guelph Jazz Festival, in a dynamic conversation focusing on improvisation across disciplines. Whether in practice or theory, in music or theatre, in classrooms or performance, themes of agility, responsiveness, community, and compassion emerge whenever improvisational methods are central. Join us for this “out of the box” dialogue between two community leaders.